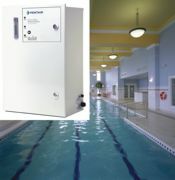 Pentair Aquatic Systems™ now offers its IntelliZone™ Ozone Generators to commercial aquatic facilities. Ozone's oxidation and sanitation power combined with traditional chlorine systems produce the clearest pool water possible. And the IntelliZone™ ozone generator system will reduce chlorine consumption by as much as 50 percent, resulting in lower operational costs for aquatic facilities. The system also reduces chemical odors on indoor pools and has no harmful byproducts. This product is NSF 50 approved. Dri-Dek's anti-skid, self-draining surface keeps wet floors dry. It's perfect in locker rooms, showers, pool areas and saunas. Just snap the 12-by-12-inch interlocking tiles together to form a custom surface of any length, width or shape. Dri-Dek tiles are available in 12 designer colors. ETS again leads the way with Validated UV systems that monitor the water and continually adjust the lamp intensity to maintain the dose required for the application, be it chloramine destruction, disinfection or both. This ETS feature extends lamp life and reduces power consumption. 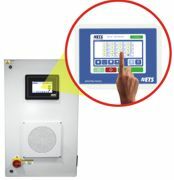 Touch Technology with Dose Pacing allows the operator/owner to monitor their UV systems from anywhere with Ethernet or Wi-Fi connections. Paragon Aquatics' new Griff's VISION Guard Station™ features a patent-pending design that minimizes deck space while maximizing the frontal edge of the guard station. The Griff's VISION Guard Station™ can be positioned close to the pool edge and accommodates most pool gutter profiles, including zero-depth entry pools, and can be used in both indoor and outdoor applications. Available in 1-step, 2-step and 3-step models. Side-to-side access allows for uninterrupted coverage of the pool area during shift changes. Downpour Derby pits players in a race to get each other wet. Crank the pump handle to fill the bucket over the head of your opponent; whoever fills it first gets them wet. This four-player unit is great for all ages and can be customized to fit in any waterpark, amusement park, splashpad, pool area or campground. Water Wars of Pequot Lakes, Minn., is a manufacturer of dynamic water attractions since 1989. PhosFIGHT™ phosphate remover has been proven to remove phosphates sourced from pool chemicals, fertilizers, cleaners and contaminants that may be introduced into swimming pool water. This product will not alter water balance. PhosFIGHT™ phosphate remover is great for use with salt generators. Wibit Sports has developed a complete line of modular, interlocking inflatables that are configurable in any layout, allowing you to create the activities and games of your choosing, so they meet your customer's interests and your facility's needs. Be inspired by the uniqueness of Wibit products to create an unlimited number of Aquagames your guests have never experienced before and bring fun, excitement and friendly competition to the water. Empex Watertoys® has introduced a new line of water features to accommodate the growing need for water features in preschool water playgrounds. Aquatots™ are a series of small childlike spray people in the form of pirates, cowboys, firefighters, police, nurses and more. 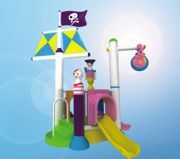 Well suited for daycare centers and preschool areas in water playgrounds for hotels and resorts, waterparks and amusement parks, the new features add a new interactive play theme to the standard water play designs.